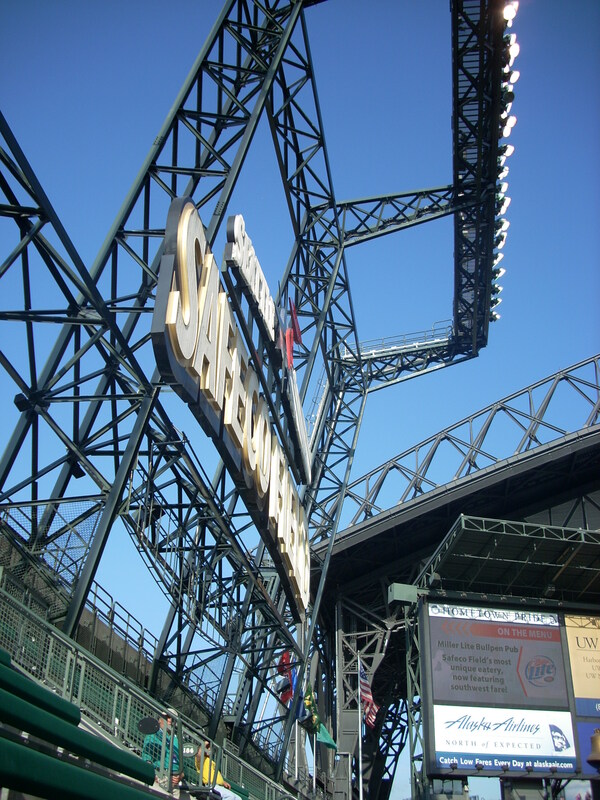 The weather was amazing; sunny yet low humidity, a cool breeze passing through beautiful Safeco Field. It was raining earlier but we didn’t even need the retractable roof. My friend and I got there around 5:30, just walking around and enjoying the festivities. I was this close to getting the infamous garlic fries (heart burn anyone?) but I think I’ll wait till I’m with my family and won’t have to worry about spreading garlic breath towards anyone :] Instead, I got me some Ivar’s clams ‘n’ chips. Um, yum! A White Sox fan was sitting next to me and was complaining about how horrible our food selection was. I’ve been to a few Major League parks and I can appreciate anything they have and definitely don’t have the image that Safeco has poor food selection. If they’re right though, I’d love to go to whatever park they go to! Last night’s game was the ultimate pitcher’s duel. Felix Hernandez vs Mark Buehrle. Both two digit game winners with low ERAs. I’m sure everyone knew this was going to be a low-scoring game but when it was 0-0 in the 13th inning, boy did it truly hit me that this was a pitcher’s duel, even way after Hernandez and Buehrle were gone! Sheesh! They were both absolutely amazing. Felix went 7, Buerhle went 8, both giving up exactly 6 hits. As a biased Mariners fan though, I also would like to mention that Felix had 10 strike outs while Buerhle only had 3. It definitely felt like Felix was getting himself in more of a jam than Buerhle was, though. Felix almost put me into cardiac arrest a few times, that’s for sure! It’s always a great game when you get to watch Ichiro in his zone. You always see his excellent offense on TV but it’s truly a treat when you get to witness his ninja-like defense in person. In the top of the fifth, Nix was on third base while Alex Rios (his frist start as a White Sox) hit a medium deep fly to right field. Ichiro ran up to the ball, caught it and within a split second (literally), he threw the ball to Johnson to tag Nix out at home base. It seriously sent chills up my spine. Johnson didn’t even have to move one bit because of Ichiro’s accuracy in locating the ball. After the grueling 14 innings of play, the grand total of hits for each team was 10 for the White Sox and 9 for the Mariners. Of course the only hit that amount to anything was the one that came in the bottom 14th. With Beltre on 2nd base (from a single, then a walk), the lights dimmed in Safeco Field as they played the inspirational yet stressful music while Griffey stepped up to bat. Everyone stood up nervously and was praying furiously (oh wait, maybe that was just me). Can you imagine? Everyone’s hands over their heads nervously while Griffey swings at a pitch…just watching the ball go deep into the very corner of right field….and as soon as the ball lands, it’s over. The insanely lengthy 14 inning game was over. I had to be careful not to fall off the ledge into the visitor’s bullpen! We were screaming, shouting, dancing, hugging, shimmy-shimmy-ing, in-your-face-ing the White Sox fans that were on my right, left and behind (why is it that I always end up surrounded by opposing fans whether or not I’m at Safeco?). Ah, who cares? We won! I tip my (pink) Mariners cap to the White Sox. Just like the Tampa Bay Rays (which unfortunately I missed blogging about :[), it’s a great, strong team to beat, the type of team you can really feel good about beating. That’s not trying to be rude, it’s actually a twisted compliment.